Prepare to bask in the glory of seating that provides comfort, stability and elegant style with the Zambezi Outdoor Wicker Sofa in Pebble, a fresh faced piece from Teak Warehouse. W79" x D37" x H32"
The Zambezi Outdoor Wicker Sofa (Pebble) is part of our refreshing range of furniture from our new line of Zambezi All Weather Wicker, sleek and chic and proving to be a hit with our customers! If you love this sofa you will love the rest of the collection! Zambezi is modern, majestic, tasteful and stylish, in short, it is every inch the next luxurious addition to your home. As well as our Zambezi Outdoor Wicker Sofa (Pebble) we have a beautiful club chair, ottoman, and coffee table to complete your deep seating unit. But wait, that’s not all from this illustrious collection. We have a fabulous Zambezi bench and dining chairs, so that you can tie your relaxing time in with a more formal seating arrangement. All the Zambezi pieces feature clean, modern lines, showcasing large sections of the gorgeous Pebble colored wicker, with deep seats enabling you to curl up and relax on lazy afternoons, or have people over for casual dinners and drinks in the comfort of your surroundings. Because of the quality and chic style of this unique design, we have found a lot of our customers have opted to bring this suit indoors as well as out! Try in your family room for a gorgeous, fresh look you will love showing off. 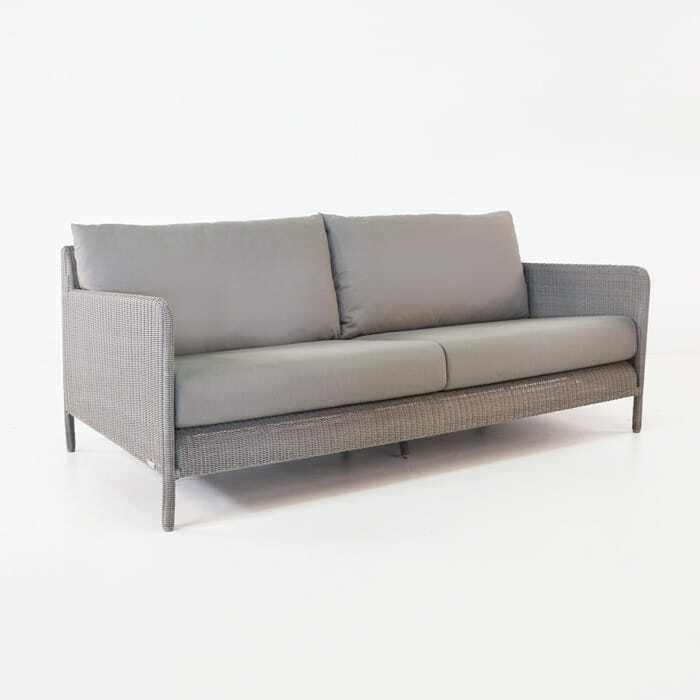 The Zambezi Outdoor Wicker Sofa (Pebble) is built on a non-corroding powder-coated aluminium frame with the lush, fabulous Woven Plus® wicker and topped off with resplendent Sunbrella® cushions – so you know you’re getting quality New to Teak Warehouse is an exciting array of colors and slim, long weaves of wicker is proving a hit with customers all over the USA! This All Weather Wicker is UV treated to combat the suns harsh rays, and through-dyed to stop it from dis-coloring. 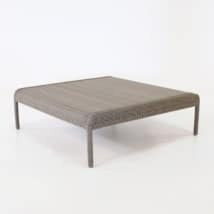 We are proud to feature this product in the Zambezi collection and across our amazing range of outdoor furniture. Teak Warehouse has everything you need to create a stunning outdoor living space – choose from phenomenal deep seating collections, dining sets, garden benches, relaxing chairs and loungers, accent tables and accessories – we really do have everything to facilitate style and comfort! 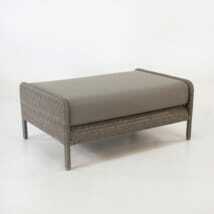 The Zambezi Outdoor Wicker Sofa (Pebble) is a beautiful central focus for your patio. 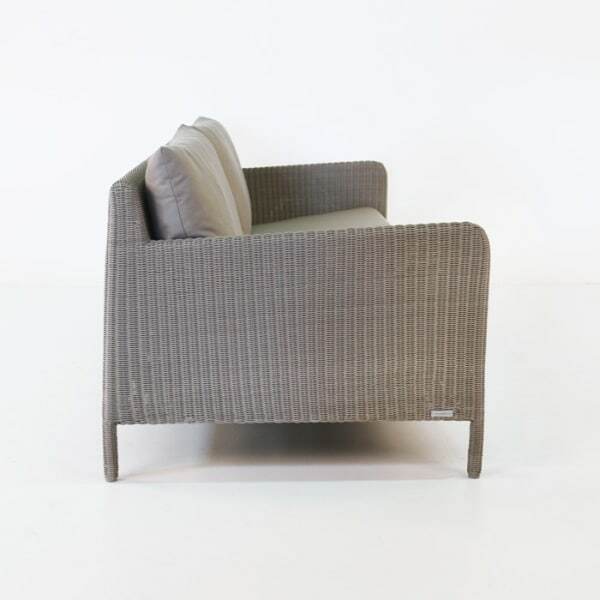 Frame either side with a Zambezi Outdoor Wicker Club Chair in matching Pebble and place a Zambezi Coffee Table in the middle, completing a cohesive, daring new look for your home. Choose a Canvas Sunbrella® cushion for chic contrast or warm up your setting with Taupe cushions. 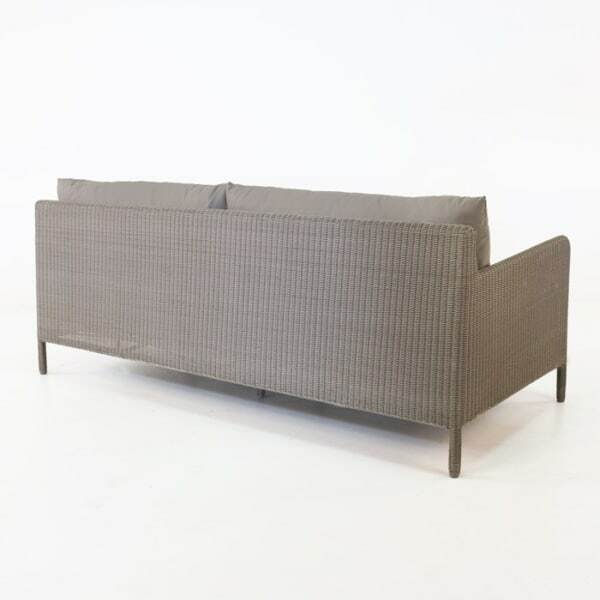 How about placing the Zambezi Outdoor Wicker Sofa (Pebble) in your TV or Grand room? Imagine something comfortable to sprawl out on while still remaining with a high standard of style. Extremely impressive, eye catching and a unique choice for your indoors. If your seaside property is in need of a comfortable spot to take in the view, and the perfect seating for casual dining, then look no further than Zambezi! We highly recommend this deep seating collection, it’s chic style fits into any surrounding without being over-powering. Our Zambezi Outdoor Wicker Sofa (Pebble) is also available in Chalk wicker and is a must for your next outdoor arrangement. Call us now to configure your next ‘living’ room!